I saw the cover of this book and was instantly transfixed. The image broke something open in me. Something felt became something named – or closer to it as I entered into the bold colors and bolder revelation. 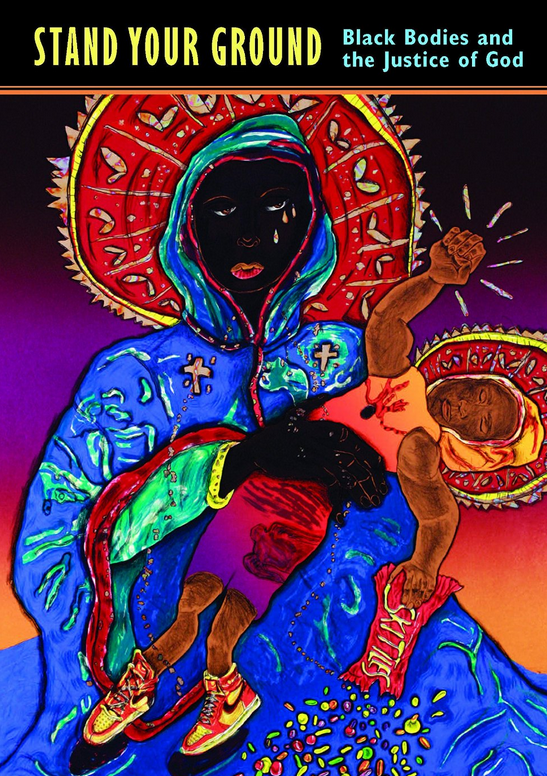 The artwork is the cover of Stand Your Ground: Black Bodies and the Justice of God by Kelly Brown Douglas. The image shows Trayvon Martin, with hoody and spilling Skittles, draped across the lap of his black mother. It evokes another Mother and Son. It’s a picture of maternal grief, her heart spilling out over the lifeless body of her son. What’s provoked in me is a fear so tangible I can taste it on my tongue. Your body, burnished and lustrous brown, draped over mine. Your immaturity, your youthful zeal and spirited emotions will, like bottle rockets, Pop! Pop! Pop! and they’ll kill you. And I will feel the weight of your dead body. You will only be known in tribute. He was wonderfully curious. He was a natural at soccer and tennis. He asked to be baptized in a river like Jesus. Only in retrospect will they know that you carried such deep compassion for others. Your story – a boy who prayed for his birth mom and protected his sister and held my hand each night when we said our blessings – will be known after the fact. This fear stings my eyes with astringent tears. My friends forget that I am a mother of a brown son. I’m a woman pierced by fear when I watch the news at night, when I see the Confederate flag decal on a car, when I see a white man with a gun in Chick Fil A – because Arizona is an open carry state. I know my own whiteness won’t shield him. Even my, especially my, suburban streets are a threat to him (not the other way around). He’s no longer the cute African baby I adopted, no longer the one showered with the affection at our homecoming by church friends. He’s out-grown onsies and sippy cups and well wishes. At this age, past eight and headed into the teens, he’s seen as brown and threatening. People look at him and think twice – and they expect nothing good from him. When my son was little I taught him not to fear the police. I told him it was their sworn duty to protect him from harm. I walked him up to an officer in a McDonald’s once so he could meet him and be disarmed of his fear; I wanted him to realize he was safe while talking to the policeman. I’ll never forget the pit in my stomach the day I told him about Michael Brown. We were sitting in a nice restaurant with gigantic tumblers of root beer as I told him about how to behave around police from now on. Always show your hands. Don’t raise your voice. Answer the questions. His eyes were the size of planets. He asked if he needed to be scared of the police from now on – and my heart broke as my guts twisted inside me. Don’t be afraid, just be smart. But I wonder if I was telling the truth. Was I, a white woman, too frightened to instruct him to live with a measure of fear toward law enforcement because it went against everything I was taught growing up? I still want him to be able to see the police like I do – but the litany of names advises me otherwise. This cover art of mother and son shocks me to my senses. I’m confronted with my own suffocating dread. This image turned icon reveals my shivering heart and what I fear when my son is stateside. What I most fear is becoming her – holding my lifeless son across my body without the hope of resurrection. My heart hurts, laments, mourns…. Oh, Kelley. Powerful words of expressing a mother’s heart and a nation’s pain. e are way more moved as people hearing one mother’s story than we are hearing statistics or even current news that is still distant and not intimate. Keep writing, keep prophesying, keep pressing in…. Oh, sweetheart. This just makes me ache. How I wish this were not the truth! And I am so, so sorry that it is. Love to you.